There's still a month to go before move in day but I have itchy feet! Nope....wrong expression...and google is not helping me. Let's just go with antsy - I am antsy to get going! I'm researching like crazy (current tabs include "raising chickens on pasture", "succession gardening" and "top 10 signs that you might be batsh*t crazy") but reading and learning is only helping to cure part of the restlessness. Since I've basically never grown anything, what better way to give myself a nice easy introduction than to, as they say in France, go COUILLES PROFONDES! We have an 85' x 8' section of greenhouse to plant in. If I were a smart little newbie, I would buy seedlings at the beginning of April to transplant...but since I really want to get going *now*, I decided to try starting some seeds indoors to see what happens. I figure I can buy seedlings later if this fails. 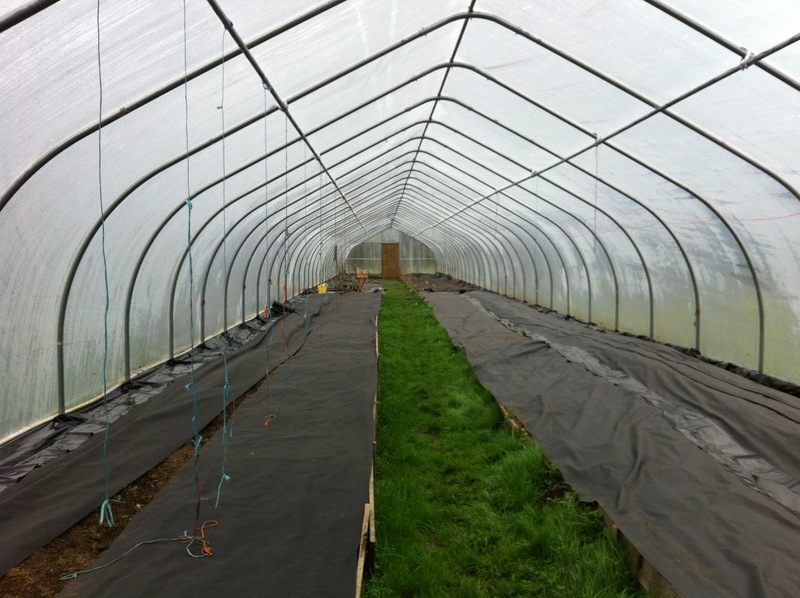 The greenhouse all covered up for winter. 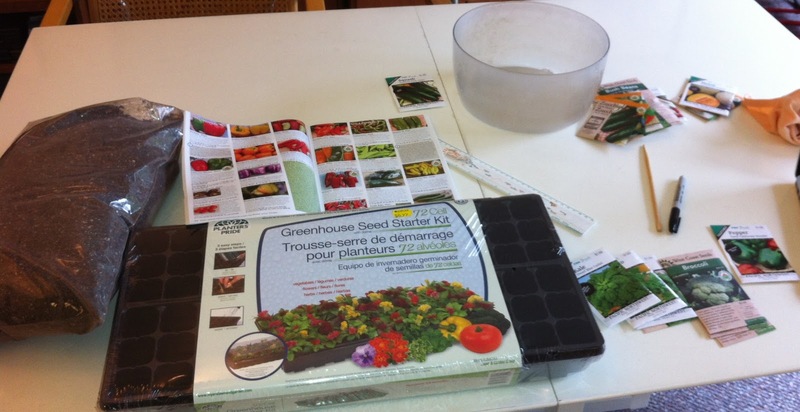 I bought a seed starting tray, some seed starter mix and, of course, seeds. I forgot labels so I made a little chart so that I know what's planted where. 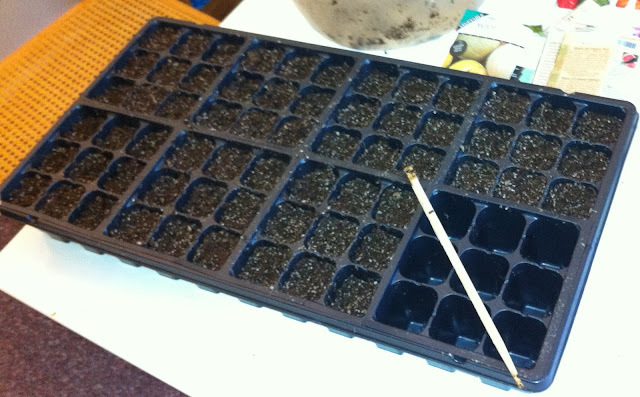 I moistened the seed mix in the bowl and filled the cells of the tray, and then poked little holes with the chopstick, planted 2-3 seeds per cell and covered them with a bit of soil (according to each packet - and the super handy West Coast Seeds catalogue). I planted bell peppers, chilli peppers, broccoli, basil, oregano, cilantro, tomatoes and then some kale and arugula, just 'cause. I figure that the kale and arugula do well in colder weather so they can go in the greenhouse right off the bat in April with a head start - they could probably go in as seeds now, I think, if I were already living there (this is all assuming the seedlings grow...the green-ness of my thumb will be determined shortly). The tray came with a plastic dome cover so I covered it up and put it on the best warm spot I could find - the floor of the broom closet in the kitchen. I have to figure out a grow light setup in the next few days. Seeds all planted...the whole things looks so cute to me! The best thing about being new to all of this is how exciting everything is! I hope that doesn't fade too quickly.